As with the murder of any animal under the so called “protection” of humans, nothing seems to cause public outrage more, particularly among AR activists, than the killing of Harambe, a 17 year old Western-lowland silverback gorilla held captive at the Cincinnati Zoo. Anyone who is on Social Media most likely is aware of the gruesome and freakish details. While in the care of his parents, a little boy “climbed over a 3-foot-tall railing, then walked through an area of bushes about 4 feet deep before plunging some 15 feet into the moat” which surrounds Harambe’s “enclosure” (euphemism for cell). Video footage shows the gorilla jumping into the moat, interacting with the boy while holding his hand, holding him in his stance, looking at him and pulling him through the water by one arm. Reports say that this interaction went on for ten minutes or so before the Dangerous Animal Response Team made the decision to shoot Harambe in the head, killing him instantly. 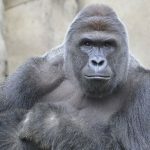 In a public announcement, Thane Maynard, President of the Cincinnati Zoo stated that the right and only decision was made when dealing with a dangerous animal, with no explanation of why the powers to be at the zoo have labeled gorillas as dangerous in the first place. From what we saw [the child] could have been killed at any second. You could look into their [zoo officials’] eyes and tell they had tough decisions to make. It was basically the child or the gorilla, and they chose. Gorillas are deep contemplators. They are observers more than reactive aggressors. Harambe’s hold on the child and his sheltering of the child inside his stance, are all indications of protection. Adult gorillas commonly drag one another and their offspring through the water, in which case the infant gorilla typically climbs up the adult to avoid the ground. A human child would not know to do this, but that does not justify defining a normal non-aggressive behavior as aggressive. I too wonder why Harambe was killed, rather than tranquilized. I’ve listened to all of the reasons why he was killed but don’t see that it was necessary. Paul Watson, who is known for his outspoken and pointed comments, agrees that gorillas are non aggressive beings and places the blame for Harambe’s murder directly on the shoulders of the parents. The zoo made the right call by shooting the gorilla. I saw the video of the gorilla jerking the boy through the water and knew what would happen if the animal wasn’t killed. I’ll bet my life on this, that child would not be here today. Shooting Harambe was no worse than raising a pig to slaughter for bacon. Sure, he had a name and an enclosure you could visit him in, but he was still property; he was still exploited for human gain. Debating the efficacy of barriers, parenting skills, and captive animal safety misses the point. These words in no way diminish the value of Harmabe’s life, but rather speak to the value of all sentient life in highlighting the destructive disconnect in which we humans engage in our daily interactions with other species. This disconnect is well illustrated in the human construct we call zoos. Contrary to industry spin, zoos are nothing more than death for profit industries which trade on the vulnerability of other species. Imagine the arrogance of the Cincinnati Zoo calling the exhibit (euphemism for prison) in which they house these majestic beings, Gorilla World. This gulag represents in no way the natural world and environment in which free gorillas live and love. And what about the ultimate insult to Harambe after the manner of his life and death have been so callously controlled and decided by his captors? Though Harambe was not yet mature enough to breed, his sperm was collected after the shooting for possible reproductive use and for research purposes. I have no words to aptly describe how offended I am on his behalf for this final indignity. We don’t need to imprison animals to teach our children conservation. Recent news reports indicate that the Cincinnati Police may investigate and charge the parents of this child with neglect. What really needs to be investigated are the myths and lies put forward by zoos in order to legitimize and defend the indefensible, with a view to ending forever the captivity of other species for our gawking pleasure. The death and indeed, even the life of Harmabe is tragic and will forever remain a stain on the history of human interaction with other species. In order that something good my come of this travesty of justice, please end the exploitation of all species caught in the cogs of capitalism and profit. ← Are We Fiddling While the Planet Burns? Any zoo that is claiming to captive breed endangered animals should not be so trigger happy. 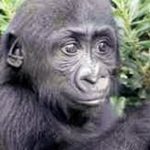 If it takes so long for a gorilla male to reach sexual maturity, they have now destroyed 17 years of their investment in the future of this species and lost a valuable animal. This makes no economic sense, never mind the ethics of the situation. The authorities at this zoo are incompetent. The zoo needs to be closed. It is not doing anything to help change the world for vanishing species, is it? If we are serious about captive breeding endangered species, for later re-release when possible, there are 2 things that need to be implemented. Firstly, all zoos in the programme should specialise in just a few species who can co-exist in the same habitat, and the whole zoo should be built to replicate the habitat that the animals naturally come from, using biodomes if necessary. All of the space should be one large enclosure, giving all the animals much more freedom. Visitors should walk through the space in an enclosed viewing area. While this is going on, the countries of origin should be working to conserve and re-create habitat for the animals to return to, educating their own people and implementing laws to protect the animals from hunting and poaching when and if returned. Our world is not safe for wild and free animals while humans can take a gun and go and kill any creature they choose and while animals are viewed as a resource that humans may just pluck from wherever they happen to be and use for whatever they like. Thank you for your considered comments. I agree with you about zoos. There are just exploiting a growing concern for wildlife by pretending to be part of the solution rather than the problem. It is true that the world of humans is not safe for wildlife or any species for that matter. I am sure that they would be fine and would thrive if we disappeared from the equation all together. Failing that, we all need to become vegan so that we have a chance at becoming enlightened about the damage we are doing to other species through our incorrect belief that we have a right to interfere and to manage other them, for whatever reason. We cannot take away the damage we have done to date, but we can easily back off and let all other sentient beings on this planet just be and and live according to their own beliefs. We live in a messed up world full of messed up people and in this case it was tragic. I am boycotting all zoos. Welcome to my website and thank you for commenting and thank you especially for boycotting all zoos. Zoos are exploitative and by virtue of this exploitation, abusive. I’m sorry to be so far behind in general in keeping up with your posts, but also very unhappy to be so late in replying to this one because I did see this story on the news and am just sick about it. It seems that everything is already very well-written and expressed in your post. I didn’t know they did that to him after he died (collected sperm), but yes, that is absolutely horrible and no zoo should be allowed to breed any of their captives, artificially or otherwise. Your post about this tragedy is eloquent and you’ve given a dignified and powerful voice to Harambe and basically all zoo inmates. … I will say this, if he was going to hurt that kid, he would have done it the second he grabbed him. I haven’t watched the videos because I can’t. But I also remember two different stories in the past about kids falling into the enclosures where gorillas are forced to live and the gorillas were absolutely protective of the little ones. This story makes me sick and I’m not the only one that would love to know how it is that parents allow this to happen. I was a nanny for several years and a big sister and have nieces and nephews and of course you can’t watch them to prevent any and all injuries. But there are some things that are absolutely inexcusable and this is one of them. And it seems that that kid is in more danger from his own parents’ negligence than he ever was from Harambe – who I’m assuming lived with other gorillas and clearly kept the kid safe from the others. Zoos are no place for anyone to be, whether you’re one of the ones forced to live there or one of the visitors. Insert big sad face here, but thank you belatedly for this post! And when I wrote that Harambe kept the kid safe from the others he lived with, I don’t mean that they were agressive at all, clearly they were not, but he did protect that child from anyone else coming close. I doubt any of them would have hurt the kid, but if anyone would have, at least Harambe was keeping that from happening. And also, did those idiots ever hear of a tranquilizer dart???? I mean, seriously. Sorry, I’m just so sick about this…thank you again for the post and sorry again for being so far behind in keeping up with your posts! The lame excuse they gave for not using a tranquilizer dart just does not hold water. Always happy to touch base with you when the stars align. Your comments and perspective are greatly appreciated. Yes, the manipulation of Harambe’s life and death is indeed a tragic story which speaks loudly to the destructive and exploitative nature of zoos. Humans have no business interacting with wild animals in this way and when they do this kind of event will continue to happen. I place the responsibility for this travesty on the shoulders of the zoo. I cannot speak to the behavior of the parents, because I was not there, but I do know, as a parent, that despite our best efforts, we occasionally can drop the ball, as it were. The only solution is to end the exploitation, close down the zoos and other such businesses which trade on the vulnerability of other species and to stop gawking at these beings as if we have an inherent right to do so. Tragic on so many levels. But glad that it has at least generated so much discussion in the general public that otherwise may not give much thought to other species. Yes it is highly tragic in that it illustrates just how much disregard we have for the lives of other species. A gorilla is a cow, is a pig is a monkey is a dog is a cat. Time for people to wake up. I remember this story and I too was horrified that it happened at all and that a tranquiliser dart was not used. It just doesn’t make any sense. 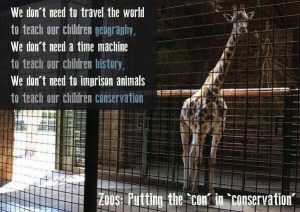 It took me a while for the penny to drop with zoos, being taken in by the whole conservation thing as many people are. It is only since becoming vegan that I have begun to see things differently and I know I will never attend another zoo again. If one good thing can come from this tragedy, at least it has highlighted the problems with zoos and hopefully more people will boycott them now. I cant believe we still have zoos. They really do belong firmly in the past. Sadly, as long as they exist I think these incidents will continue to happen. Thank you for your article. Beautifully written, as always. I often think about Harambe and his sad life and death. I certainly hope that the continued pressure from the public hastens the demise of using nonhuman animals for entertainment and profit. I am glad that you enjoyed my article.